Robert Venditti talks patriotic superhero series 'Freedom Fighters' in a world where the Nazis won WWII – AiPT! A few days ago Robert Venditti told us why you should read Freedom Fighters. Well, it’s out now in comic stores, so what are you waiting for? I also spoke to Venditti in more detail about Freedom Fighters, talking about why it was the perfect book for Venditti to write at the time, who his favorite heroes on the team are, and how the politically-charged nature of the series may or may not be well timed. Check out all his answers below to get the scoop. AiPT! : The Freedom Fighters is a very politically charged book — I mean, there are patriotic heroes fighting Hitler’s resistance. What, if anything, inspired you and Eddy Barrows to create the story now? 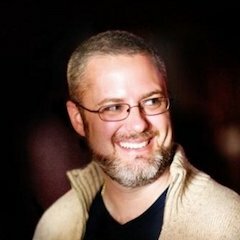 Robert Venditti: DC approached me about writing Freedom Fighters and I was already working on a project called Six Days which is my first non-fiction graphic novel based on a true story that will be out from DC Vertigo on May 14th. I was already working on that and it’s a story about a battle that my uncle was killed in as part of a group of paratroopers who were the worst miss drops of all of D-Day. In researching that and really thinking about World War II and thinking about how I’d only ever thought about the war in terms of the people who came home. All the war stories I’d ever heard from my grandfathers were always from the survivor’s perspective, obviously. Looking at this story and researching Six Days and speaking to my own family about my uncle it was the first time that I ever was in that headspace of thinking about that war from the perspective of those who didn’t survive, you know. And so when the opportunity to write Freedom Fighters came along it was an opportunity to deal with a similar material of World War II. But instead of looking at it from the perspective of the sacrifices that were made by citizens and soldiers that we’re able to thwart the Hitler regime and achieve victory, what if those sacrifices hadn’t happened or hadn’t been enough? And Hitler’s regime had won? It’s two sides of the same coin. So it was an opportunity to think about the material and examine it from a perspective that I’ve never really thought about before and do it all set within this universe of familiarity but unfamiliarity. To see how all the people and places connect to the world we live in or in the DC Universe but are unfamiliar in their own ways and presented in different manners to really flesh out this alternate version of history. AiPT! : So you were in the right headspace for Freedom Fighters when you were offered the title? RV: I was already deep down the well on Six Days in terms of research on things like that. Six Days and Freedom Fighters are going to be on the shelf at the same time. It’s two different ways of looking at that same issue. We’re going to continue to do that throughout the series and really flesh this out. What it is at its core is about heroism no matter how dark and no matter how bleak things can be. There’s always going to be good people who can present themselves and put the world back on its right path to our better natures and that’s material I’m always going to enjoy writing and I’ll always find inspiring no matter how dark the time. Goodness will win out. AiPT! : Is there any particular character on the Freedom Fighters team that you like writing more than others? RV: I kind of like them all, but I like Doll Girl a lot. I also like writing Human Bomb a lot. He’s a very tragic character. You know, this is someone whose power set means if he touches skin he explodes. So that would be a very alienating, very lonely existence. So he sort of presents that as a very gruff exterior because if you continually push people away you don’t have to worry about feeling lonely when they can’t get close to him. AiPT! : I apologize for saying this, but he’s basically Rogue on steroids, isn’t he? RV: I haven’t thought about that. I kind of think he’s a little like Guy Gardner. He’s rough and offputting, for different reasons. I was kinda keeping it DC, I wasn’t going Marvel with it. AiPT! : No no, yeah, my headspace is everywhere. Yours is probably very focused on one universe. AiPT! : Uncle Sam has to be one of the most — I don’t want to say weird, but he has very unique powers, like size alteration and his ability to teleport. What is it like writing a character like this who has almost every power imaginable? RV: [laughs] Yeah. Our version is going to take from past versions. There will probably be little differences to try to streamline him because there have been a lot of different iterations of Uncle Sam. For us, he’s the living embodiment of the American spirit and what the American ideal is and what the nation is meant to be. And so at the beginning of our story, he has disappeared. He hasn’t been seen in quite some time. And this new crop of Freedom Fighters, which is a new generation that you know America has been living fifty plus years under Nazi rule and they haven’t even seen him in decades. The American nation that you and I know has been gone for so long with these people they never even knew it could have been a possibility. 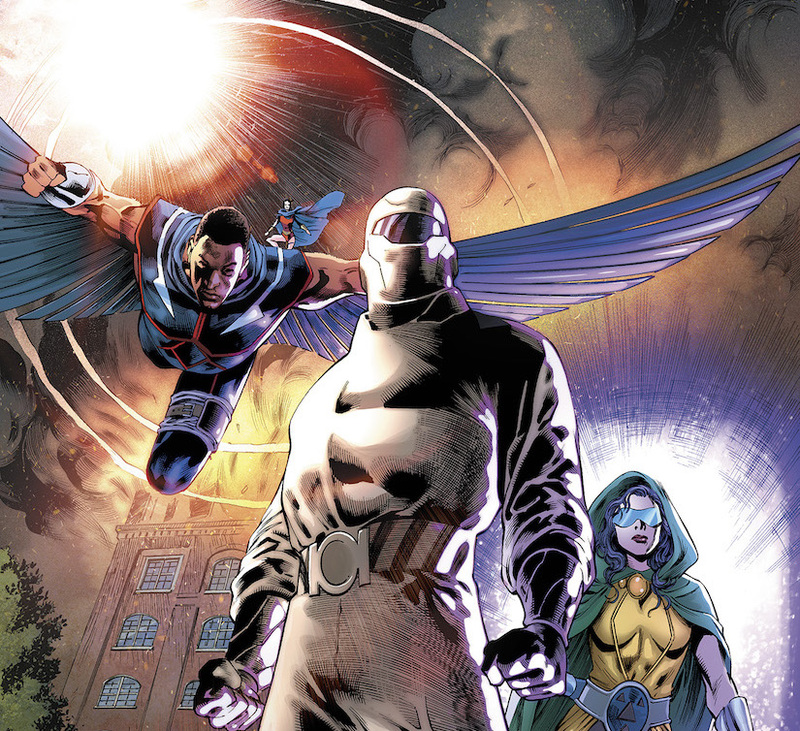 A new group of Freedom Fighters has decided to take up the mantle in the name of the prior team and the prior members Black Condor, Human Bomb, Phantom Lady and Doll Woman. We have some other characters as well that we introduce. Our team is taking up that mantle to try to restore that American spirit and get that revolutionary fervor going again so that they can bring Uncle Sam back. Who as you said, is a very powerful character but it’s only as powerful as the strength of the American spirit. So they’re trying to stoke that spirit, bring him back and then begin a revolution that will hopefully rest America from Nazi control. AiPT! : It seems so fitting that it’s coming out now because I feel like with the political climate the way it is it feels like patriotism is almost a nasty word used by the wrong person or in the wrong place. I think it’s well-timed that Freedom Fighters is coming out right now. Is there any correlation to what’s going on in the world and why this book is coming out now? RV: Everything you write, as a writer, if you’re doing it correctly it comes from your own influences and your own experiences in your life, no matter how fanciful the world is, be it Green Lantern or Hawkman, Surrogates or Freedom Fighters. It’s all born from that same place. For me, though it was much more, going back to Six Days and talking about that and where I was at when I was writing that book. The emotions that I was grappling with and I was trying to write a story about a member of my own family who had died in World War II and there was no longer anyone in my family left alive who had anything beyond the most very rudimentary two sentence memories of him. Someone who is gone now and never came home and never had children and grandchildren. Any of those life experiences. So emotionally it was a very difficult space to exist in to write a book. When the opportunity came to do this one alone. I just didn’t feel like I was done grappling with all of that yet. I mean what are the chances for somebody who’s never done a World War II story in their life to kind of do two different variations of World War II stories that are going to be on the shelf on the same month. Freedom Fighters is about the world that we could have had if not for all those who sacrificed. And I don’t just mean soldiers I mean citizens and soldiers and everyone who sacrificed. And it’s a world that we could still have if we lose sight of the goodness within ourselves and in our better natures so I think more than anything you know that’s kind of what the series is about. You can purchase Freedom Fighters #1 digitally today.